We all know some of the challenges that the transportation and logistics industry is facing such as the capacity crunch and the driver shortage. Both factor into each other and make it seem like there’s an endless list of available jobs with only a few available candidates in the talent pool. Part of the revolving door is that drivers feel like because there are so many available jobs that if one company isn’t treating them right, then they can jump to the next one. That means that you have to be quick to get to the right candidate and you also have to make sure that the person is the right candidate for the job, otherwise you are losing a lot of money. At the 2018 in.sight user conference + expo, both Jamie Nielsen, Divisional Vice President of HR and Joe Shilkrot, Talent Acquisition Manager of Trimble Transportation Mobility, led a panel discussion on how companies can best position themselves to hire the right candidates and retain them through the hiring process. Internal First Steps – Once your company decides that it needs to hire another employee, the team needs to sit down together and define the roles and responsibilities of the job. Know who will train the new employee and who will oversee their duties once hired. Create a Detailed Job Posting – Candidates want to know what the job entails and a little bit about the company as well. Provide a company overview. Then, include the job requirements, the description of the position and a percentage breakdown of the daily responsibilities. This way there aren’t any surprises. Ensure Company Branding and Culture are In-Sync – An estimated 92% of candidates would consider leaving their current company if approached by another company with a great reputation. Further, organizations that invest in branding are 3x more likely to make a quality hire. Those two stats alone should tell you how important branding and company culture are. Before looking at candidates, make sure your company’s vision, mission, culture and employee benefits all reflect how you want the company to be known. Also, make sure to keep an eye on LinkedIn, Glassdoor, Google+ and other comparable websites to monitor what people are saying about the company. Define the Interview Process – Your team should all be on the same page before heading into an interview. Know who is going to sit in on the interview, prepare a strategy and create job-specific questions. 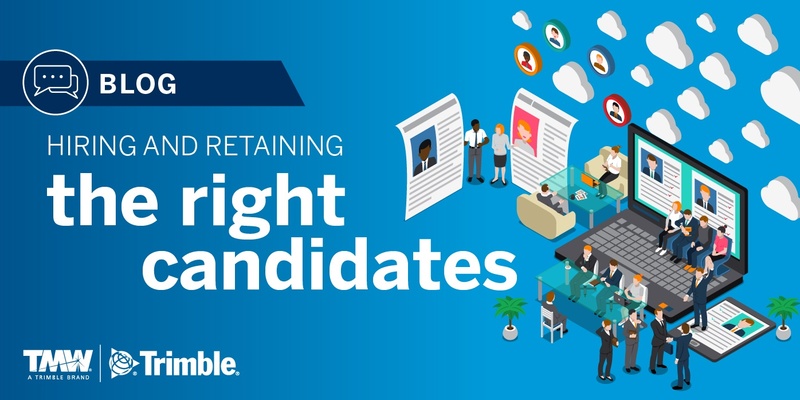 Identify the Right Candidate – Don’t rush through the hiring process. This is a fact-finding mission, so don’t make any assumptions. You want to identify the right candidate who is a team player with some soft skills. That may require you to slow down your decision-making process. Retain the Recruit – Orientation and onboarding are just as important finding the right hire. Remember, there is a multitude of other job postings out there. Consider providing lunch on the first day of the recruit’s orientation. Treat them with respect and train them for the job according to how you outlined it in the job posting. Manage your Talent – Check in on your employees. Conduct performance reviews and create plans for career development. The workforce is changing to become more filled with millennials, and they want continuous feedback. The takeaway? Be engaged with your employees. These tips come in handy for hiring qualified drivers and they can be applied to open positions across your company. Retain them for the next time you are considering hiring new employees. And for more information on product offerings from Trimble Transportation’s Business Intelligence for retaining drivers, contact us today. Let’s talk about Driver Scorecards for driver retention, better business margins and profitability.